View over Namadgi National Park from Mt Ginini at sunset. Photo: Visit Canberra. 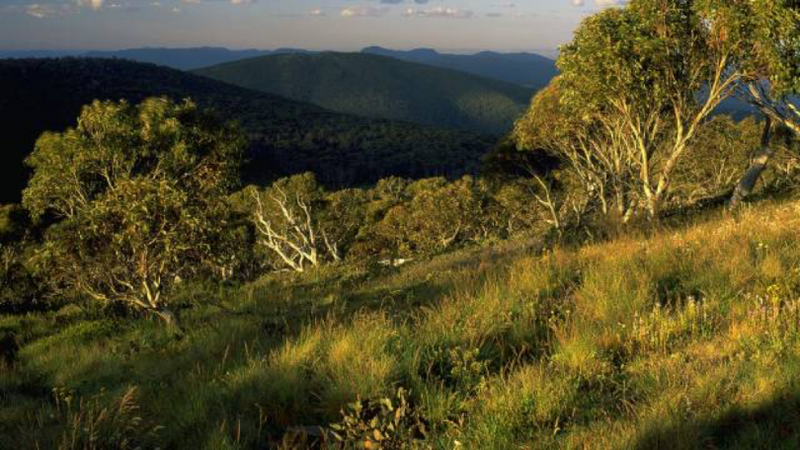 With the edge of Namadgi National Park park just a few kilometres south of Tharwa, the outdoor paradise is virtually on Canberra’s doorstep. The protected area is rich in Aboriginal heritage and home to abundant birdlife and wildlife. There are plentiful picnic and fishing spots, fantastic bushwalks with scenic views, and ranger-guided wilderness activities available. There are some top heritage tracks and plenty of granite rock outcrops to climb or abseil. Namadgi National Park shares a border with Kosciuszko National Park. The terrain ranges from grassy plain to snow gum forests to alpine meadows, and the fauna is just as varied, with a wide range of native animals as well as some threatened animal species. There’s an excellent Visitor Centre where you can get expert advice and see displays and audio-visuals. Explore the campsites, ceremonial stone arrangements and rock art sites left by the Ngunnawal people more than 21,000 years ago. Then trace the trail of pastoralists and gold hunters. Four wheel drive to the top of Mt Coree, fish from trout-filled streams and cross-country ski the winter slopes. See kangaroos, wallabies and northern corroboree frogs and explore snow-gum woodlands, wetlands and wildflower-cloaked plains. – Aussie Specialist Namadgi National Park Factsheet. And a RiotACT favourite – Booroomba Rocks. There’s some excellent fishing to be had in many of the streams that run through the park, but be aware that there is a closed season and some gear and bait restrictions apply. Check out Fishing in the ACT for more information. Horse riding is permitted on some of the fire trails, but riders are advised to contact the visitor centre for information and to arrange access and use of yards. There are over 400 kilometres of trails available to cyclists within Namadgi, Brindabella National Park and Bimberi Nature Reserve; just be sure to stick to the designated areas. Namadgi National Park is less than 45 minutes from Canberra city but considerably less from many parts of Canberra. Follow Tharwa Drive through the village of Tharwa then follow the signs to Namadgi. Namadgi is so close to Canberra that it’s worth exploring in all seasons! Be aware that snow can fall over any part of the park in winter and chains may be required. Contact the visitor centre for details before you set off if you’re going in winter. Duration: it takes around 45 minutes from the Canberra CBD to drive to Namadgi Visitors Centre, and much less if you are coming from Tuggeranong or the southern suburbs. Distance from Canberra: the distance varies depending on where in the park you are visiting, but it is less than 40km from the city to the park entrance just beyond Tharwa. Cost: admission to Namadgi National Park is free. Recommended for: anyone looking to get up close and personal with nature without travelling too far, and especially walkers and hikers. More information: Guide to Namadgi National Park. What is your favourite spot to visit in Namadgi National Park that you think others should know about? The article warns cyclists to stay off formed roads when I understand bikes are only allowed on formed roads (fire trails).